So, remember how last week a guy got accidental access to a "mock" debug menu for the Wii U? There might be more to it than that. 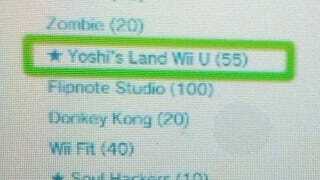 While messing around in there, a description of a game called Yoshi's Land Wii U was found. That listing has since been found on retail sites. Seeing as Nintendo is yet to announce the game, don't count this as confirmation, as retailers are free to conjure up whatever fantasies they want for their systems. But having them listed alongside the Miiverse description is certainly interesting.